While the origins of knitting are unclear, we know it has been practised in many different parts of the world, over many centuries, producing objects of great beauty as well as items fulfilling practical needs. When done by hand, it has used simple tools, such as hand-carved sticks of wood, bone, quill and ivory or metal wires and fine steel knitting needles that were commonplace in the 19th century. Hand-knitting today is most closely associated with flat-knitting, which is worked in rows using two knitting needles and where the piece is turned from front to back on each row. But there is also a long history of knitting 'in the round'. Here, four or five needles are used to create a continuous seamless tube – a technique particularly used for caps, stockings and gloves. Today's dominance of flat-knitting is partly because it's easier to represent on construction charts and patterns. 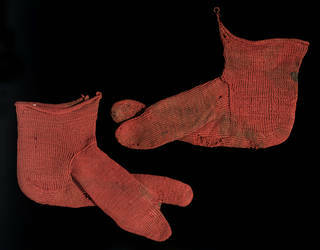 An early woollen item in our collection is a pair of socks from Egypt that date from the 3rd to 5th century AD. They have been made using the technique 'nålbindning', a laborious technique more akin to sewing than knitting, where yarn is threaded through the eye of a sewing needle and then worked in the round through a series of loops. Some believe that this technique was a forerunner of the faster method of knitting with two or more needles. 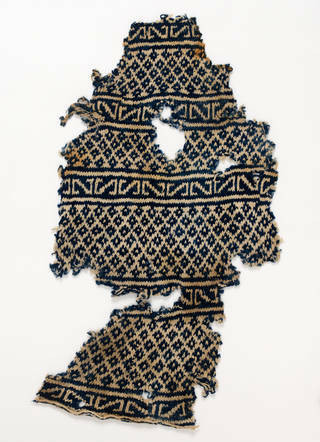 The earliest example of double-needle knitting in our collection was made in North Africa in about 1100 – 1300, during a period of Islamic rule. 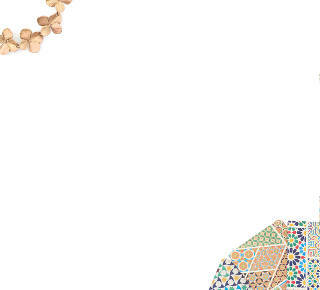 The blue and white abstract design echoes the colour combinations and patterning found in Islamic ceramics. It's likely the sock's shaping was achieved by changing the size of the needles during knitting. We know from archaeological finds in medieval cities and surviving tax lists that the use of knitted goods spread in Europe from the 14th century. In England, the manufacture of knitted caps was sufficiently important to merit control by parliament. The Cappers Act of 1571 stated that every person above the age of six years (except for "Maids, Ladies, Gentlewomen, Noble Personages, and every Lord, Knight and Gentleman of 20 Marks Land") in England on Sundays and holidays should wear (except when travelling), "a Cap of Wool knit, thicked and dressed in England, made within this Realm, and only dressed and finished by some of the Trade of Cappers, upon pain to forfeit for every Day of not wearing three Shillings four Pence". This act helped sustain the production of caps in England, thereby protecting the livelihoods of their makers. The Museum holds a number of 16th-century knitted caps that were discovered following building works in a house in Worship Street in the City of London. The location of the finds, combined with the fact that the caps are knitted, suggests these caps were made for the middle classes. Many such caps were trimmed with ribbons to imitate more expensive silk versions. The size of one cap suggests it may have belonged to a young boy. It is closely knitted in wool and was probably once red (possibly dyed in madder), a fashionable colour of the time. 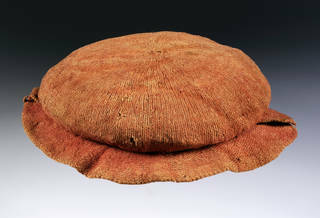 These caps were generally constructed in one piece in the round – the method still used for knitted berets today. 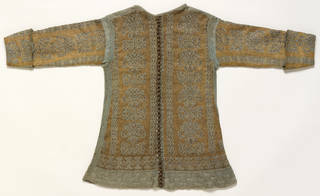 Knitted silk jackets were fashionable in the early 17th century, worn as informal dress and known as 'waistcoats'. Our collection includes a particularly fine example of a knitted silk jacket from this period. It was knitted by hand in plain silk yarn and silk partially wrapped in silver thread, in contrasting colours of blue and yellow. The back and two front pieces have been knitted flat before being sewn together, with the abstract floral design imitating the appearance of woven silk textiles. It's been suggested that knitted panels, typically used in the construction of such jackets, were imported from Italy and were put together by the client. The jacket is finely finished with silk-lined sleeves and silver thread buttonholes. 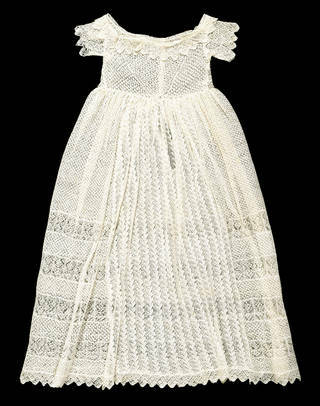 A hand-knitted petticoat in our collection, dating to the first half of the 18th century, demonstrates extraordinary knitting skill, unparalleled in any other known collection. The cream-coloured petticoat has a surface decoration of trees and animals, including an elephant, a lion, an ostrich and a rhinoceros. It has been knitted in the round with no seams and has a circumference of over three metres at the widest point. It's not known exactly how or why a piece of such size and detail was made. 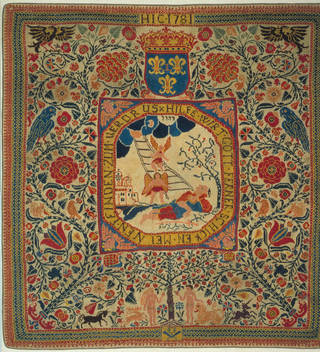 Knitting guilds developed from as early as the 14th century and another virtuoso example of 18th-century knitting in our collection is a carpet or hanging, believed to be an example of a journeyman's work. It took three years of training to become a a trained apprentice or journeyman. To gain full membership of the Hand-Knitters' Guild of Strasbourg, journeymen knitters had to produce 'masterworks' – knitted pieces demonstrating their skill – including a cap, a woollen jacket, a pair of gloves with fingers and a wall hanging patterned with flowers. 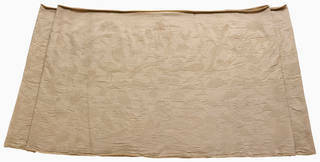 The Museum's carpet or hanging shows Adam and Eve beneath a central panel depicting Jacob's Dream, from the Old Testament, with a German inscription that translates as "God will continue to send help in despite of mine enemies". The stocking frame was the first mechanical knitting machine and was invented by William Lee of Calverton, near Nottingham, in 1589. As its technology developed and the stocking frame became more refined and efficient, factories opened and the rural knitting industry began to die out in Britain. Although it continued in some poorer parts of the country, over the 18th century hand-knitting mainly became the domain of wealthier ladies who had the time to devote to developing the skill. By the mid-19th century, so-called "fancy" knitting was flourishing as an elegant drawing room occupation. 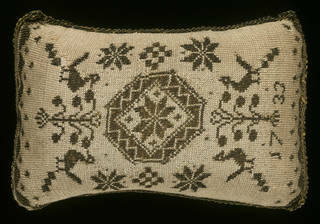 Decorative objects such as net purses or pincushions were made by well-to-do women to demonstrate their taste and skill. A pincushion from our collection has been knitted on fine steel needles from cream silk and silver gilt thread. The initials "EW" appear on one side, with the date "1733" on the other, and a decoration of flowers and birds. As well as being part of a refined lady's repertoire, knitting was deemed an acceptable way for gentlewomen in personal need to earn money. Also seen as a useful skill for poorer members of society, it was taught in orphanages and poor houses. The first recorded knitting schools had been established in Lincoln, Leicester and York in the late 16th century and hand-knitting for income continued in Yorkshire until well into the 19th century. The Ackworth Quaker School in Yorkshire was established in 1779 for girls and boys "not in affluence". 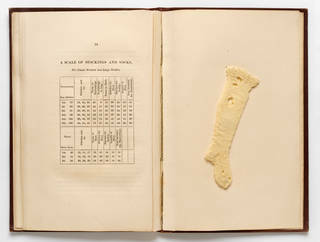 According to records, its female pupils knitted 339 stockings in 1821 alone. The National Society's Instructions on Needlework and Knitting was the first British publication of its type on knitting. It was a handbook for use in the Church of England charity schools run by the National Society, a body seeking to promote Christian education, especially among the poor. The pupils would also have been shown how to sew and knit by a teacher as the instructions in such early books were difficult to follow for anyone unfamiliar with the craft. Hand-knitting featured prominently in the knitwear section of the Great Exhibition, held in Britain in 1851. A number of the submissions were from children and disabled adults and were noted for the remarkable proficiency that they demonstrated. Some of the more unusual entries included a knitted landscape, a shawl knitted with a prayer for the Houses of Parliament and a pair of cuffs, hand-spun and knitted from the wool of French poodles! Particularly popular were the kind of hand-knitted and beaded lace items that couldn't be copied by knitting machines. The Museum holds an extraordinary baby's gown that won third prize in the Great Exhibition's hand-knitting section. Knitted on extremely fine needles, the gown's patterns of open stitches are similar to those of the knitted Shetland lace shawls popular in the 1840s. It was said that this gown was made with over a million stitches and 6,300 yards of cotton and that its maker, Sarah Ann Cunliffe, worked seven hours a day for five months to complete it. During the 19th century there was also a boom in needlework publications, with the establishment of series such as Family Friend and Weldon's Practical Needlework. The standard abbreviations now in common use in knitting patterns were established by Weldon's in 1906, while individual pattern leaflets started being printed at the beginning of the 20th century. Home-knitting continued to be a popular way to create items for warmth and for children but it reached another peak during the Second World War when people were encouraged to pick up needles for the war effort. While domestic home-knitting continued through the 1950s, the knitwear made by machine-knitting was more varied than ever and more affordable. It wasn't until the craft countermovement of the 1970s that hand-knitting gained an influence once again. Designer Kaffe Fassett helped shift attitudes towards hand-knitting in the 1970s. 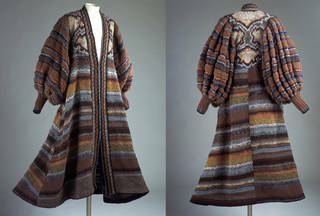 A coat designed by Fassett in our collection reveals Fassett's unorthodox approach to design. 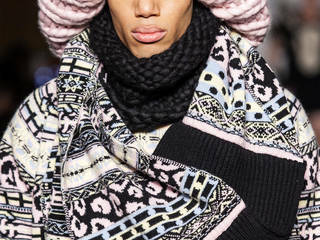 It uses a variety of yarns in different thicknesses and textures. Hand-knitted by Zoe Hunt, the order of the stripes and the patterning evolved as the knitting progressed. Fassett's use of geometric patterns and a rich palette of different shades has continued throughout his influential career. He summed up his colour philosophy in a 2002 interview in Vogue Knitting International, saying: "Why limit yourself to just one shade of red when you can use 17?" 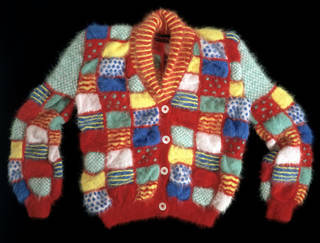 Patricia Roberts' hand-knitted cardigan was inspired by the patterns on decorative china plates. The kaleidoscope of stitches in bright primary colours emphasises its handcrafted appeal and the striking patchwork effect is achieved by alternating blocks of different kinds of stitches. In an interview with the V&A, she described her belief that, "the more you invent stitches, the more eloquent you become and the further you can push them". This cardigan is typical of her innovative designs, which use bold colours, contrasting textures and decorative stitches.